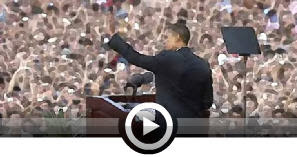 Bild is running a competition for the best remix using Senator Obama's Berlin speech. This blogger hasn't checked out the videos. However, he did listen to the 25 (at post time) music clips posted, and believes that #3 "People of the World" by Marcelo Paffenholz comes out on top, with an honorable mention for #4 "Obama's First Danse" by Nicolas Krupp.